Safety is our no. 1 priority. Whether it is a climbing expedition, a leisurely trek or an overland tour, safety is never compromised. We do not recruit on the spot freelance staff whose backgrounds are unknown in any region or in any of our trips. 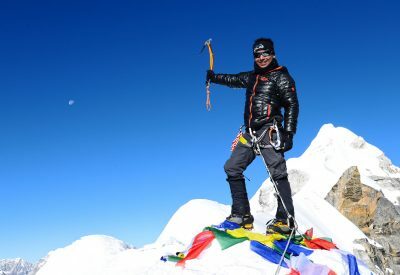 Saran Subba, the Managing Director of Hi On Life Adventures, has himself lead groups of various nationalities in over 170 treks and expeditions in different parts of Nepal, Tibet and India. This has helped us built a rapport with the local people in various regions. We have carefully handpicked reliable, passionate and hard working people from different areas, who comprise our Hi On Life team. 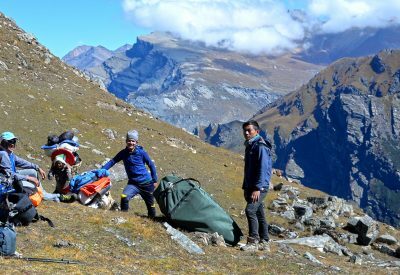 Our guides are well educated and have undergone extensive medical training under mountain medics, emphasizing on high altitude medical treatment and rescues. All our trips are only in areas that we have trekked before, and that our leaders and staff are well versed with. Before organizing any groups in new areas, we make a team from within our staff and send them on recce trek to collect all valuable information and risk factors before organizing any group. If there is any information on political unrest or precarious conditions of the trail, we inform our clients and offer them either a cancellation on full refund or a transfer to another similar trip. After every trek, we collect reports from our Leaders and our staff along with the questionnaires filled by our clients, and makes a detailed risk assessment for every activity and location. Our Leaders are trained in all policies of risk factors or unfortunate incidents such as theft, accidents or even casualty. In incidents of medical emergencies which require evacuation, it will be carried out by a helicopter. As with any other mountain environment, helicopter evacuation is weather dependent and delays of several days may occur. Clients must therefore accept and acknowledge this risk in their booking application. In cases of client not being able to continue with the group or need to be descended due to medical conditions and AMS, or he/she is never send back alone. One of our staff with a fair knowledge of English will accompany him/her. 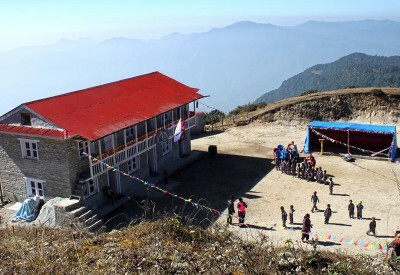 Our ratio of client to staff is usually 1:1 in lodge/ teahouse treks, and 1:3 in camping and climbing expeditions. We use only reliable and high quality tents such as Hilleberg, Mountain Hardware and Ozark tents for all camping and climbing expeditions. 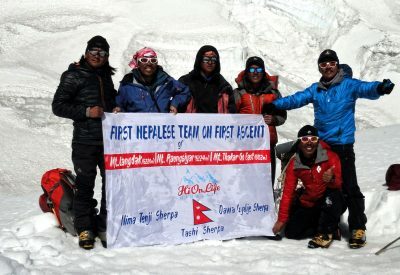 Our climbing guides have a very in-depth knowledge and experience in climbing and rescue techniques, and use the best lead and fixing ropes, rock-ice-snow anchors, rescue equipment, communications equipment, full-climbing equipment for safe ascent and descent and high-altitude camping equipment, and the best oxygen equipment available. We believe “It is better to bring too much than not enough” and this extra preparation is one of the key factors in our tradition of safe and successful ascents. We have a 24 hrs emergency support operation center at Kathmandu. On any emergency our Leaders can make direct contact with our support center for logistics and advisory support. There is mobile phone connection in most part of the treks in Nepal. On remote treks such as far west Dolpo and Makalu and in Climbing Expeditions, we send Satellite phones and radios. On every trip our Leaders carry a comprehensive first aid medical kit and also carry “Gamow bag” and medical Oxygen on extreme high altitude adventures. Our leaders are trained to diagnose and treat various medical conditions such as cold and flu, allergies and food, diarrhea and food poisoning, sprains as fractures and mountain sickness. In an unfortunate incident of an accident or medical emergencies which requires evacuation, it will be carried out by a helicopter. As with any other mountain environment, helicopter evacuation is weather dependent and delays of several days may occur. Clients must therefore accept and acknowledge this risk in their booking application. In Tibet and China, neither helicopters nor light aircraft are allowed. The evacuation might be via Yak and Jeep to the nearest hospital. Travel insurance is mandatory. 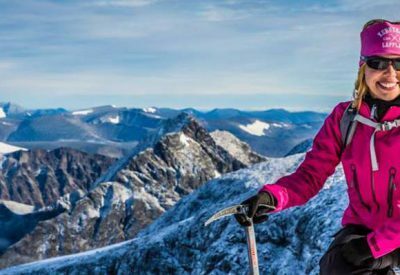 Full-coverage insurance is essential, because it not only covers mountain climbing, but also covers travels to and from the mountain. Before purchasing, please check the terms of the policy carefully. You must be covered for travel, medical costs, full domestic rescue, helicopter (where available) and international rescue and repatriation expenses. On arrival to Kathmandu we collect your copy of insurance. NO INSURANCE = NO TREK/ EXPEDITION MEMBERSHIP. We do everything possible we can to give you a nice, safe and memorable trek/expedition in the Himalayas – WELCOME!